Home based women entrepreneurs are collaborating with cooperatives for producing and marketing Khadi garments. KHOTANG, Oct 28: It was their ancestral occupation. However, the new generations of Sakela village of Khotang gradually lost touch with the production of khadi as weaving cotton by hand was considered a ‘low job’. Girls and boys switched to other occupations. But in the recent years, the ancestral profession is getting its hold back, thanks to local women’s revived love for Khadi and entrepreneurship. “During the time of our grandfather, you could have seen every home around here weaving looms. It was their occupation. 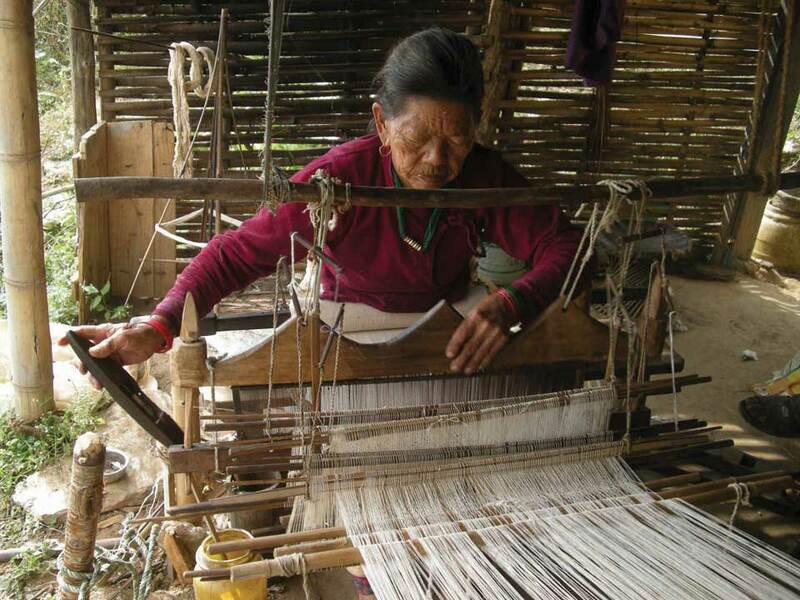 They would do it to make cloth for themselves and others,” said Sangita Rai, a local of Sakela village. “Nobody would stay idle at home. Children would learn weaving khadi from their early age. That was a great time,” she added. As she grew young, fewer people were seen taking interest in Khadi. Many left village for foreign employment. Women, who were in village started trying something else too. “A very few women were still weaving Khadi when I was a child. Gradually they too started switching to other occupations,” reports Rai. Locals claim that they didn’t see any future for Khadi clothes and therefore saw no point in continuing the occupation. “We had no idea of its demand outside the village. We were not aware about marketing, distribution and other commercial tools for selling the product,” said Rai. “In lack of support, we were deviating from what we were skilled at doing,” she added. Because it is ‘in our blood’, we are best in weaving Khadi, she claimed. The only problem for them was to get access to market for their product. “Our occupation skills were at risk. We were almost done away with it. But on the other hand, we were not doing any other job either,” stated Anjana Rai, president of Mahila Ekata Manch. “But a training on weaving khadi once again connected us to the work,” she added. Mahila Ekata Manch, which intervenes in several issues for the welfare of women, had taken initiative to revive the khadi weaving industry. Sakela Rural Municipality and the Manch offered free training to women to develop their entrepreneurship skills in Khadi industry. The training provided from 19 March to July 12 had been taken by 13 lead women. And those trained women were further supported to start and expand the domestic textile industry. According to president Rai, the women were also given management tips. “The training was massively successful. The women were not only united, but also provided with all the necessary support and tips to start up business and make it sustainable,” she remarked. She added that the women found it very easy to catch up with the work as weaving cotton was not a new skill for them. “Our ancestral occupation was on the verge of extinction, but somehow it has been saved now and it is actually flourishing,” she further said. Women are making a good income through textile industries. Interestingly, they are further expanding their businesses. “Earlier it was a domestic affair. They would weave cotton just for personal use. Now, women have connected with a huge market outside, and they are excited,” said Anjana. “New designs are in demand and we are trying to satisfy our customers,” she added. The women don’t have to toil hard to sell their products. The clothes are picked up right from their factories. Coat, waist coat, muffler and shawl, among others are the most common clothes high in demand. The clothes made of pure cotton have high demand in and outside the country. “We feel that we should focus more on quality, so that we can raise the prices of our products,” Anjana said. Women who weave clothes are generally paid around Rs 8,000 per month. Those who work for longer hours are paid accordingly. The Manch is the umbrella organization of these small industries and takes care of managing their sales. “We make sure that things run well, without hassle, for the small industries. Women who were working independently have also come under the Manch as it helps them get better market for their products,” said Anjana. “Labors, who are women again, get Rs 8,000 in general. But the pay varies as per their contribution,” she added. Anjana further stated that the women are even provided bonus payments from time to time. And this has further encouraged them, she said. “When the industry makes good profit, bonus is provided to staffs. This has made women feel good about their work,” she noted. Kala BK, Bishnu Rai, Sangita Rai, Pralabdhi Rai, Gandhi Rai and Pushpa Rai are some of the names associated with the Manch. They say they are happy with the new entrepreneurship that came across their way. “We feel independent. This is a great job. Earlier, we hardly understood the value of being self reliant,” said Gandhi. “Now we are not only independent but also are learning to do business,” she added. Khadi dresses are considered good for health. Bangladesh and India are quite ahead in exporting Khadi and Nepal lags behind in this regard. According to the women in Sakela, the scenario would change for better if the government pays attention to the skills and interest of Khadi village.